This is the title page of 'A Tour through the Island of Jamaica, from the Western to the Eastern End, in the Year 1823,' written by Cynric Williams and published in London in 1826. 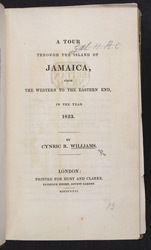 Williams visited Jamaica in 1823 and wrote of his experiences, describing the customs of the inhabitants of the island as well as their work and patterns of daily life. Williams supported slavery and praised what he believed to be the good quality of life enjoyed by the slaves.